In our journey to become data ninjas, it’s never a solo thing. Many people from all around the world contribute to our learning and growth. Looking back, we wished we had a go-to list of resources that could address our different needs at different points in time. So, we’ve compiled what we found helpful along our journey and put together this list to guide you along yours! You can also get this resource list as a pdf copy right in your inbox. Congratulations on discovering the magical realm of Power Query, Power Pivot and / or Power BI! Maybe you stumbled into this realm by accident. Perhaps you overheard someone talking about it. Nonetheless, it must have dawned upon you how this magic can change your (Excel) life. Thing is, you’re bursting with excitement to share it with someone else. You want to get your team on-board. You need your supervisor’s green light. You try telling them about it. And then you realise, gosh, where do you even begin? How do you tell someone what Power Query, Power Pivot and / or Power BI is? More importantly, why should they care? Somehow it just doesn’t come out… impressive. If only they could just get it! So, first, you show them. You could build something specific to your team using your data sets. Or you could make use of this automated Power Query and Power Pivot sample template to do a live demo. If you’re connected to the Internet, you could also use this interactive Power BI dashboard. Great! You’ve really got your supervisor’s and teammates’ attention this time. Problem is, they’re not too sure how everything fits in and where to start. Actually, truth be told, even you struggle to place them. These blog posts lay out what these tools are, the scope of problems they are meant to solve, how they are related to each other, and how to get started. Matt focuses on the challenges Excel users face with Pivot Tables and shares how Power Pivot smashes through those limitations. Doug shows you step-by-step how Power Query’s user-friendly interface gets your data cleaned without all the manual drudgery in normal Excel. Most of all, it’s a repeatable sequenced workflow. Think of all the time and pain you’ll save! When you’re ready to get started, this blog post guides you with step-by-step instructions and screenshots on how to install the Power Query and Power Pivot add-ins for Excel. There is an accompanying video at the end of the post. Gil’s series of pitfall posts is a must-read for aspiring data ninjas. This is about the battle scars he racked up and how we can avoid making some of these costly mistakes. He sets up those situations blow-by-blow, highlights where exactly things break down, and then shows you how you can avoid those pitfalls. We love the detailed screenshots! Like Gil, this post by Matt could only have come about from his years of experience with DAX. He succinctly explains his 19 tips that cover naming conventions, loading and shaping data, modelling, and other advice. Immensely helpful! This slightly more technical piece by Marco makes clear how to better use the available memory, especially if you’re using 32-bit Excel. You’ve probably been told / read somewhere before you should only bring into your models the data that you really really really need. This post explains exactly the impact of having unnecessary rows and columns on performance. We find that the most cost efficient, rigorous, and methodical method to build up those Power Query / Pivot / BI muscles are good ol’ books. Our favourites are listed below. They have great opening introductions that contextualise the data work we do and the environment we operate in - We don’t often come across such well-nuanced descriptive prose which we find ourselves nodding a lot to! The books are packed with highly applicable examples which we frequently come across in real life. We tend to reach for them from time to time as we build solutions for our consulting projects. We’ve provided links to Amazon where you can buy hard copies or eBooks. Even if you don’t have a Kindle, you just need a Kindle app to download the eBooks. Works great across laptops and multiple mobile devices! One reason to get the eBook option is because you get new content for free if the authors decide to upgrade the book. ATTENTION SINGAPORE RESIDENTS! You can also borrow the hard copies and / or eBooks available from the National Library. You’ll need an Overdrive account and the Overdrive app to download the eBooks on your mobile devices. This was what got us started on our Power Query journey. We’ve managed to ninja our way through 80% of the usual data cleaning, shaping, and preparation work that we do with the exercises in this book! And this was what kicked off our Power Pivot journey. We liked the schematic diagrams that helped us understand abstract concepts, the many hands-on files we could tinker with while we worked through the book, and the easy-to-understand step-by-step explanation of DAX syntax when applied to case problems. We recommend this book after you’ve gotten the hang of Power Pivot DAX basics. Start on this only after you’ve finished the previous book “Power Pivot and Power BI”. This book assumes you’ve got a certain level of grasp on DAX as it jumps right into very applicable real-world issues. This highly visual (130 illustrations!) 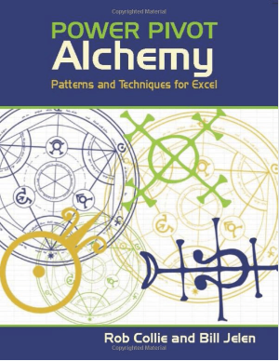 how-to guide contains 35 data magic tricks over 84 pages and is accompanied by 6 downloadable cases across both Excel and Power BI applications. We enjoyed the very clearly laid out chapter structure - Briefing, How-To, and Summary. Pay particular attention to the “Recommendations” and “Personal comments from the authors” segments in the Summary. They contain “leverage” that really turbocharges your data wrangling skills in a really short span of time. Reza has been diligently adding content to this eBook every single week. His 4th edition as of January 2019 contains more than 1,700 pages! It’s so huge that he now breaks it into five books. In his own words, “if you want to learn Power BI from ground zero to sky hero, you would need to read them all”. It’s got content from Level 100 to 400! If you’re wondering why he would publish all that material online for free, it’s because his take is that the traditional publishing process wouldn’t be able to keep up with the fast-paced changes in Power BI! Alright, this isn’t an eBook. It’s an eCard. And a pretty darn nifty one at that. On the opposite end of the spectrum of Reza’s book, it’s this 8-page cheatsheet jam-packed with Power Pivot DAX tips and best practices. We recommend using this for a good round up after your initial forays into this magical realm to see if you’ve got your basics down pat. If you can’t quite sit with a book, or need a more visually-rich environment to help you learn, here’s a list of well-structured online courses. Step-by-step, they incrementally build upon each chapter to get you from zero to hero. [Validity] 1-year access, reduced price for subsequent years. [Approach] Self-paced learning. Bite-sized and fast paced. For the most interactive, engaging, and inspiring learning experiences, nothing beats in-person trainings. Whether you’ve got questions on the concepts, formula, functions, or just want to bounce possibilities, your trainer and fellow classmates can give you on-the-spot answers and feedback! Trade data war stories and learn from each other’s experiences over breaks and lunches too. If you find yourself getting distracted by tenthousanddifferentthings while self-learning via the earlier options, this will be the fastest, richest, and most focused way to get a solid start. Here’s where the rubber hits the road. No matter how you much read, or learn through books, online and offline courses, it’s the real deal when you actually work on your own data models. For many useful fundamental concepts and principles, we believe the resources above will get you rather far. Heck, they also include gold nuggets of advice that got crystallised from much experience! However, when you’re working on that specific nitty-gritty that just somehow doesn’t seem to work, here’s when you reach out to the forums for some inspiration or help. Power Query / Pivot / BI have been around for a while and there’s a significant repository of information you can do a search on. If there’s no close match to what you’re looking for, you can also post your questions. Be sure to give enough context, or include a sample data file (keep the structure, leave out sensitive and confidential data) so that the community can help you out. Need a quick reminder of the syntax for Power Query’s M or Power Pivot’s DAX functions? Head on over to Microsoft’s official documentation for a refresher. When figuring the most effective functions to use in our consulting projects, we find it helpful to scroll through these lists to discover new functions that we don’t already know exist but think they might given existing adjacent functions. We know this list is by no means comprehensive. If you’ve got a highly recommended resource to add to it, do let us know in the comments below!